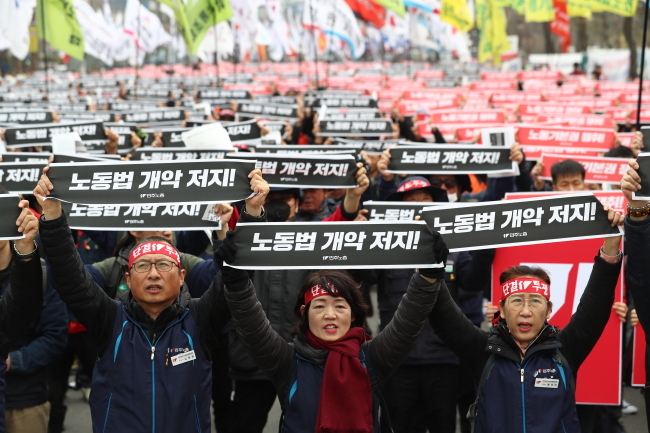 Some 10,000 members of the Korean Confederation of Trade Unions on Wednesday held a protest urging the government to adopt key conventions of the International Labor Organization in continuation of its efforts to allow temporary and dismissed workers to join labor unions. The rally in front of the National Assembly in Yeouido, Seoul, follows a recent statement by the Korea Employers Federation opposing the conventions, rebutting the union’s key arguments. “The government and the National Assembly colluded and announced changes for worse such as flexible work hours and minimum wage system. Now they are attempting to worsen the country’s labor laws without ratifying key ILO conventions,” said the KCTU. It added it intends to put a stop to “legislation at the request of chaelbol (conglomerates)” and pursue approval of ILO conventions. The conflict between labor unions and KEF erupted after the European Union stepped up pressure on the Korean government and the National Assembly to sign four of the eight key ILO conventions in a letter sent earlier this month. The hard-line KCTU argues that temporary and dismissed workers should be allowed to join labor unions as in France, among other countries. It also supports workers categorized as “special form of employment” to be given the right to organize. Workers of the special employment type such as delivery workers are not guaranteed basic rights because they are legally classified as self-employed. The number of workers classified under this type reaches 2.2 million, accounting for 8.2 percent of the country’s labor force as of late 2018, according to figures from the Ministry of Labor and Employment. KEF, on the other hand, claims that the issue of signing the ILO conventions should be approached carefully as labor reforms dealt at the state level. “The argument that related stipulations in the Korea-EU free trade agreement would affect local companies lacks basis, is exaggerated and is inflammatory speculation,” the KEF said in statement. It added the Korea-EU FTA agreement stipulates efforts should be made to ratify ILO conventions, and claimed that not signing them does not translate to a violation of rules. Ramping up criticism against the union, the KEF said deep labor-management conflicts that stem from hard-line labor unions have a profound impact on Korea’s brand image, countering the union’s argument that not ratifying the conventions would affect it. The due date for reaching a consensus on the ILO conventions is April 9. If no consensus is reached, the EU would take the next step and convene a panel of experts. The key conventions that Korea has yet to sign are: freedom of association, protection of the right to organize, abolition of forced labor and the right to collective bargaining.